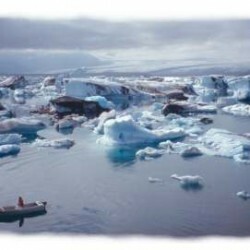 I made my first trip to Iceland in the summer of 1996. I had just under 3 weeks to stay. This web journal is about my trip in the summer of 1999. This time I had 4 full weeks. Again, as in 1996, none of my friends could make the trip so I would go it alone. This trip circles the main bulk of Iceland. The shown route is 2000 kilometers in length (not including the bus trips). I rode the bus from Höfn to Egilsstaðir (due to expected bad weather) and into Dettifoss (due to a tremendously crappy road for cycling). Flying into Iceland, my trip started and finished at Keflavik, site of Leif Ericsson Airport. Everything arrived safely, and as usual, it was cold and cloudy. I took the cab to the Keflavik campground (about $10). The campground had a storage container for bike boxes and a large grocery just 50 meters away. 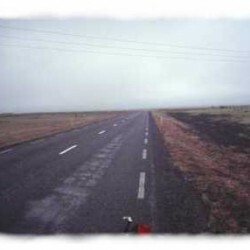 I waited a few hours for the rain to lighten up and then rode south towards Grindavik, about 40 km away. I don’t like being in Keflavik much, everyone is either coming or going, or waiting to go. I intentionally avoided Reykjavik, a nice place to finish the trip, but far to hectic and busy for the beginning of a long trip. I also avoided Blue Lagoon, which is supposed to be great, I guess, but I’m just not interested. I knew I would be a bit out of sorts for a couple days, getting used to being alone and all. The best way to deal with it is to just get on with it. 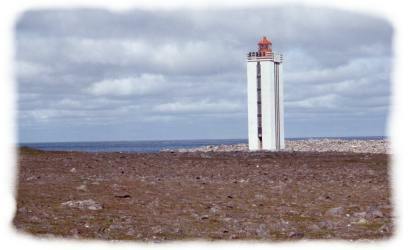 I rode down the coast from Keflavik, past the Reykanes Lighthouse and across the large lava field. 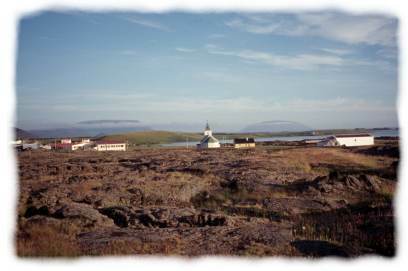 Grindavik lies on Iceland’s south coast. It is one of two towns on the south coast with a good harbor. The campground is inside of a rectangular wind bunker and is free. In the evening the women’s semi-final for the Icelandic Cup (football) was held next to the campground. 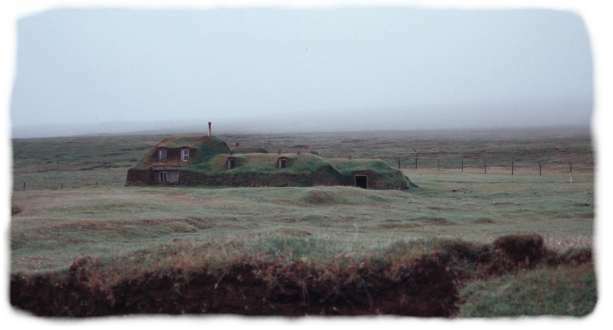 Grindavik played the reigning chamions, Breiðablik. It was a one sided match with Breiðablik winning 5-1, but it was still some of the best football that I’ve seen and I stayed for the whole match inspite of the cold and bitter wind. The next day was sunny, but cool and windy. Fortunately the wind was not in my face, but blew gusting from the north, making for an awkward ride with a fully loaded bike. I stopped at the Krysuvik Church, but didn’t ride over to the famous steam vent (saw it last time). Some of the road in this stretch was pretty bad, being badly washboarded and loose gravel for several kilometers at a strech. 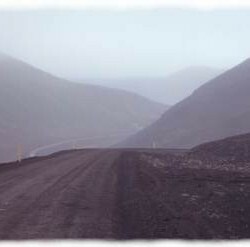 About 15 km from Hveragerði the road is paved. It was only 77 km, but I was pretty tired by days end. 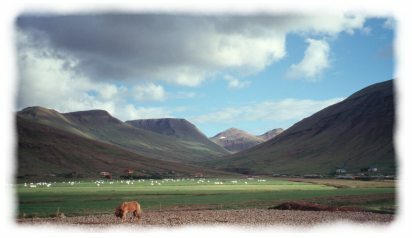 the Hveragerði campground was in the schoolyard, nothing to write home about, but free. I treated myself to a big pizza (Icelanders like pizza) and beer. Second night, Hveragerði, home to 40% of Icelands greenhouses. The town sits on a very active thermal area and taps into the ground water to heat the greenhouse, their homes and their excellent swimming pool. I met Bob, an artist and art instructor from Florida, who was just finishing a 4 week solo bike tour. He was dead dog tired as the same wind that had been blasting me from the side had been blasting him in the face, and he had been riding for 12 hours. Bob had also made a wrong turn worth 4 to 5 hours. He was a HAPPY camper. Bob and I took in the pool the next morning (a good way to start the day, as well as a good way to finish the day). 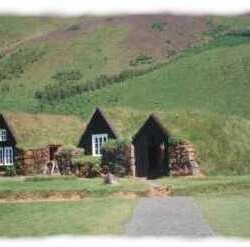 Hveragerði’s pool has a large swimming pool, 2 hot tubs (38C and 40C) and a natural steam room. The hottest tub also had a big unlabeled yellow machine mounted on the wall. It had two push buttons, but we didn’t know what it was and weren’t up to experimenting. So, this old guy gets in, and he is one of the oldest guys I have ever seen in a swim suit. He shoots us the evil eye and goes over to the yellow box, puts this rubber strap around his shoulders and pushes the top button. Good thing too, ‘cuz without that safety strap the old flyweight would have been shot out of the pool like so little whale snot. The yellow box was some kind of evil Icelandic experiment in converting outboard motors into jacuzzis. After a minute, he shuts it off, then gives us a most knowing look and leaves. Bob said it was the Icelandic version of the Orgasmatron (from Woody Allen’s movie, Sleeper). Of course, we both tried it out, and that’s pretty much what it was. All pain, all the way back to childhood, was gone. Then, I got on my bike and continued east to Hvolsvollur. 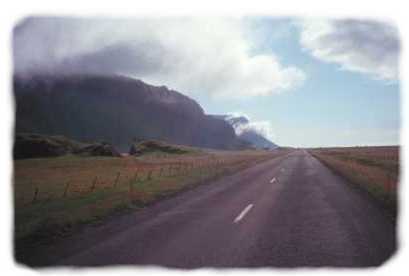 The scenery from Hveragerði all the way to Eyarfjallajökull is just like the photo to the right. It’s flat farm land, mostly grass and grazing. Unfortunately, it stayed cloudy, otherwise I think there might have been a good view of Hekla, Iceland’s most famous and most destructive volcanoes. This is highway 1 and is paved for the next few days worth of riding. Sweet and sour pork, an orange, some chocolate and tea for dinner. Then a bunch of reading, Haldor Laxness’s masterpiece, Independent People. 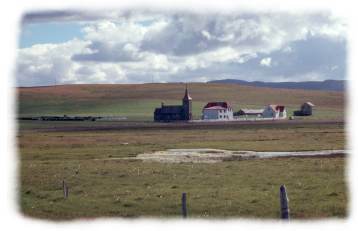 The story of a poor Icelandic farm family in the early 20th century. The book really came alive while reading it in Iceland. Hvolsvollur wasn’t much, it’s a farming community and a place for people to stop along the way. The campground had the best carpet of flat, soft turf, very comfortable. It drizzled frequently. 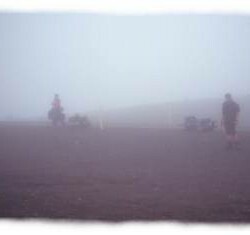 After riding an hour in the murk, the clouds broke, showing me the edges of Eyjafjallajökull, a glaciated volcano. Waterfalls tumble off the cliffs and farms are tucked up along the bluffs. A light tailwind also came up as a bonus. This is where the real scenery begins. Eyjafjallajökull and the larger Myrdalsjökull have active volcanoes underneath their glacial caps. The Katla volcano under Myrdalsjökull has is overdue for an eruption. Earthquake and subglacial heating have been on the increase in the last year. 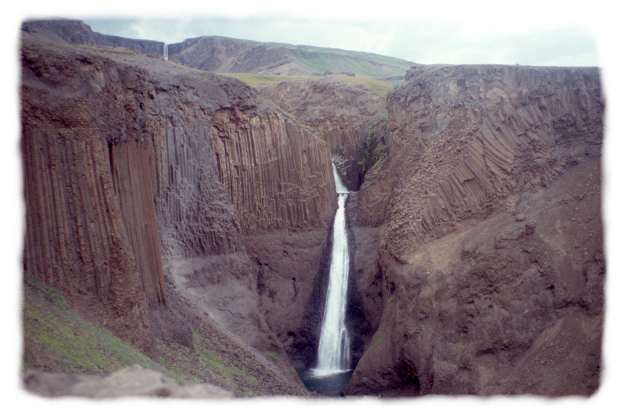 Katla can cause extremely large flooding when it erupts and melts the surrounding glacial ice. Skogafoss lies just 1/2 km off the highway. For obvious reasons it is a popular stop. The falls are 60 meters high. There is a campground right where this photo was taken. 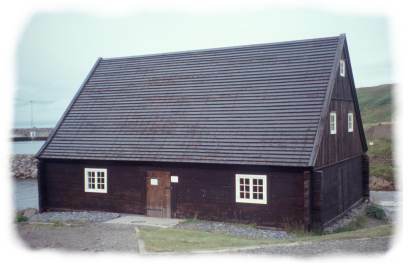 The Skogar Folk Museum is a 1/2 km east of here. 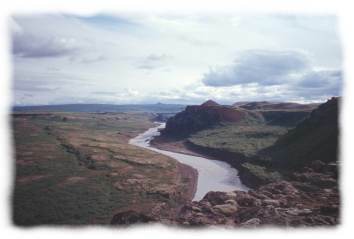 A hiking trail starts from here and follows the river crossing a pass inbetween Eyjafjallajökull and Myrdalsjökull into þorsmork. The Skogar Folk Museum is excellent. It features a large collection of fishing gear, including the 17 man fishing boat, Petersey, viking age relics from the area and the usual household items from the past. The Petersey is a twin masted open boat. It was built in 1855 and used until 1940 on fishing trips between Vik and the Vestmann Islands. 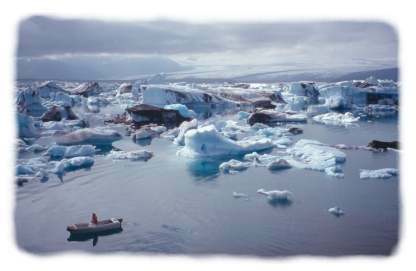 It is a tough and tubby boat as Vik has no harbor and the boat would have had to be beached. Outside of the main museum are several historic buildings that have been relocated to the site. The turf building below is a mid 1800’s farmhouse, stable and workroom. The sunny weather was a treat; this area is the rainiest in Iceland. 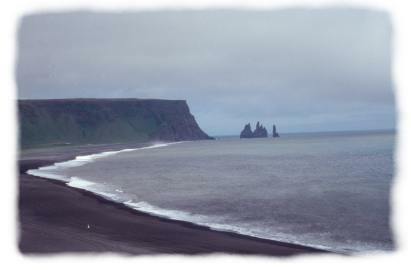 The next stop was Dyrhólaey, a big block of an island and a natural preserve, a few kilometers off the main road. 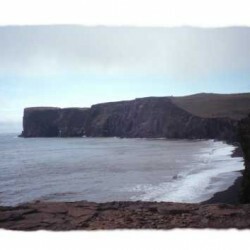 The cliffs to the right are over 100 meters high. There is a huge tunnel through the penninsula, but it can just barely be seen in this photo. From Njal’s Saga we know that Kari Solmundarson, Njal’s son-in-law farmed here. 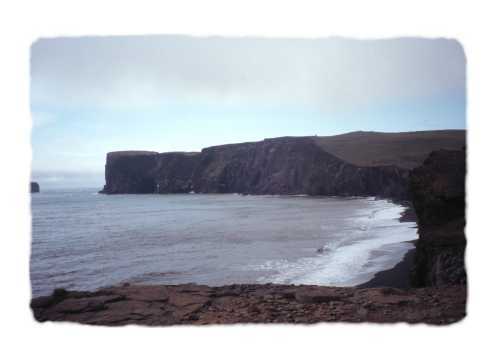 It is a spectacular spot with basalt cliffs, black sand beaches and abundant bird life. I saw gannets, jaegers, puffins, gulls and of course, terns. There is a puffin colony in the top ofthis sea stack. Puffins nest in burrows. They also taste quite good. 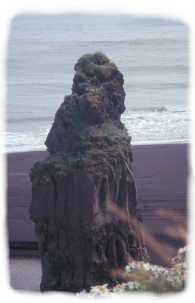 Vik lies to the east of the Reynisdrangar. 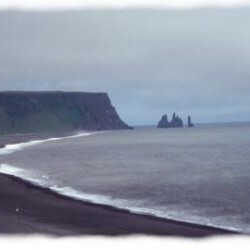 As you can see in that photo, the road did not follow the coast, but it turned inland and climbed up and over the ridge to drop down again to the sea and Vik. Unfortunately, the sunny weather did not stay. Vik was windy and cool, but it was not raining, which is something of a rarity for the rainiest town in Iceland. The campground is set up for grim weather.There is a large glassed in day room with cooking facilities, showers and a laundry. I took a walk on the beach and a stroll through town (population about 500). For dinner, cheese, crackers, cocoa, coffee and freeze dired lasagna. 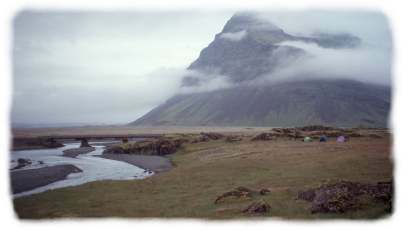 In the event of an eruption of the Katla volcano under Myrdalsjökull, Vik lies directly in the path of what could be a huge flash flood (jokullaup) of melted glacier. So much so that the town has had evacuation practice this summer. Morning was nice enough. The clouds let up and it was time to get out the sunscreen. Not far out of Vik the Myrdalssandur begins. 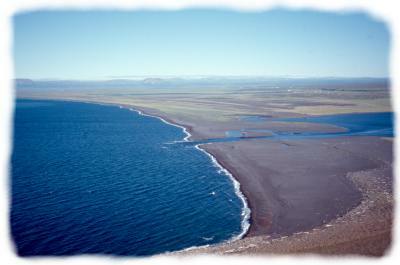 The Myrdalssandur is 700 sq km of sand flats that have originated from jokullaups and volcanic eruptions. In high wind conditions sandstorms can occur and apparently can be quite nasty. The sands are flat enough that ships have run aground not knowing that they were approaching land. Today, there was nothing but a gentle breeze at my back. After looking at a map of Iceland and seeing the huge ice caps it is a little weird to see how flat and low the mountains are. But what they lack in height they make up for in size. 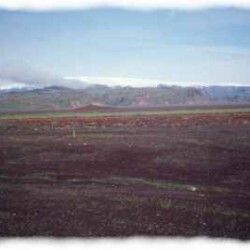 To the right: Myrdalsjökull seen from the Myrdalssandur. 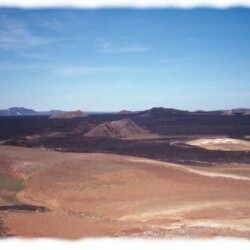 The black lava sand is prone to drifting and in places has taken over farmland. 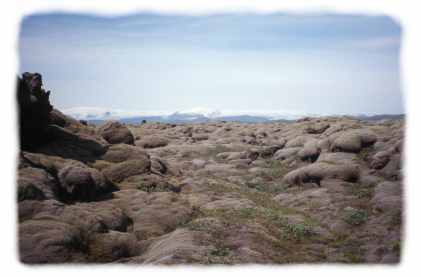 After crossing the Tungafljot river the road enters the Eldhraun, a lava field that was layed down by the Laki eruptions of 1783. 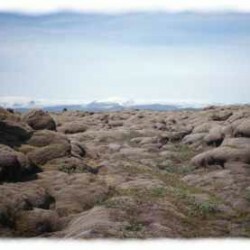 The lava field covers 565 sq km and averages 12 meters in thickness. It is the largest lava field from a single eruption. After 200 years the lava is decked over with moss and heather. At 65 km I turned left onto the road to the Laki Fissure. At first the road is fine, but once past the last farmhouse the road becomes rough and loose and sometimes steep. 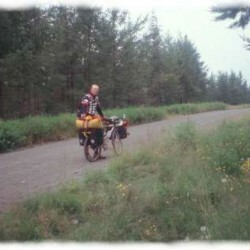 Twice I bounced both rear panniers off of the bike going down hill. I fixed that by putting cross lashing the bags with a 1 inch nylon strap. At least the road was not sandy, the only times I pushed were on steep uphills, but even on level stretches the pace was slow. There were five or six stream crossings, but the water was only mid-shin deep and not cold or fast. I finished the day at an old sheep station, Blagil, after 101 km. Woke to a cloudless sky. Bumped along for 15km up to the Fissure. Had the fissure to myself. Interesting, but not worth another night. The fissure starts near the large mountain on the right. 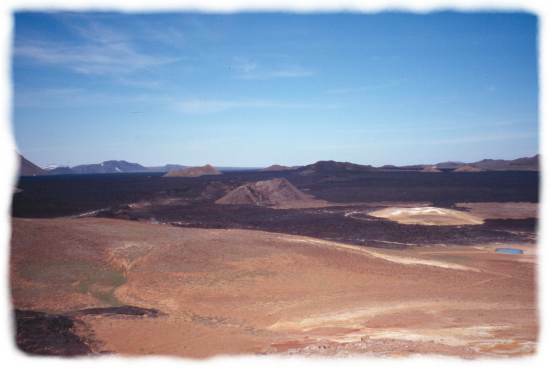 The hills on the other side of the lava field are some of the spatter cones. hiking route out in the pseudocraters. There were many plover and curlew as well as the old road through the area. Kirkjubæjarklaustur? Shall I break that down into English for you? The cloister disappeared with the reformation, but the farm and church are still there. Iceland does an excellent job with public art. The monk figures here are about 2 meters tall. 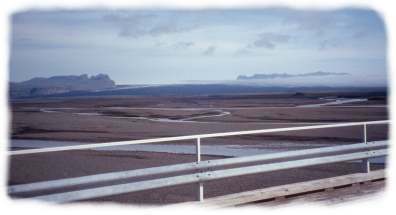 A 1 km long single lane wood decked bridge, with turnouts.The Skeiðarasandur is a large sand flat at the bottom of the Skeiðararjökull, one of many glaciers that flow off Vatnajökull. 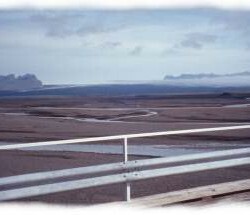 This is a huge area that gets regular jokullaups (flash floods) when the Grimsvötn volcano under Vatnajökull dumps it’s collection of meltwater. 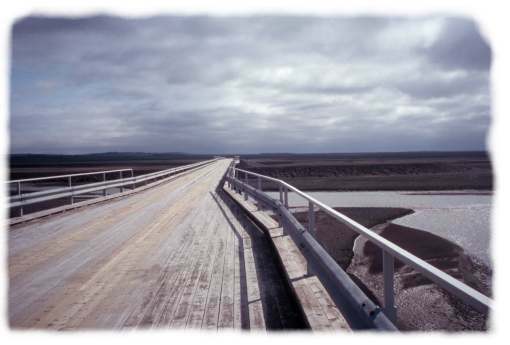 Typically the flood occurs on a 10 year cycle, but high volcanic activity produced a spectacular flood in 1996 that washed one of these long bridges away and did major damage to the rest of the road. When Grimsvötn dumps it’s meltwater it comes blasting out from under this glacier, Skeiðarajökull. The flood then spreads out over a broad plain of braided streams and gravel. The day was a bit grey, but still the area was amazing. After crossing the Skeiðararsandur I stopped at Skaftafell, one of Iceland’s National Parks. I know it’s very beautiful, but at this time in my trip it just felt like there was a lot of people there. So I ate lunch, bought some postcards, and got back on my bike. I met a german guy, Mathias, and a just before rolling out, 2 Kiwis, Jo and Andy. Jökulsárlón, a big bay full of floating ice and a restaurant with the best cakes and pastries that I came across in Iceland. The guy in the boat pushes bergs around to keep the channel open for the amphibious tour boats. The ocean lies about 1 km to the south from here. I caught up with Mathias and we rode together to Jöklsárlón, a big bay of glacial ice that has calved off of Vatnajökull. We met up with Andy and Jo there, and decided to camp together that evening. The birds for the day were two red throated loons, seen in a small pond next to the road. Mileage, 139 km. 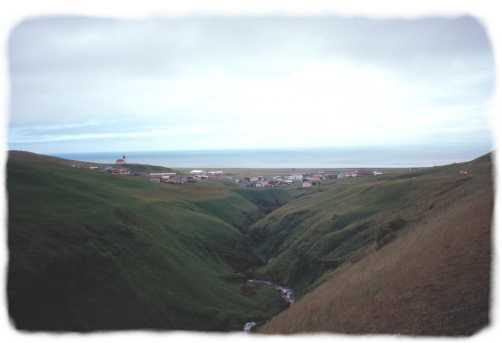 Höfn, the center of the universe and one of two towns on the south coast with a good harbor. It rained during the early morning, but stopped for breakfast. It rained lightly for the full 60 km into the sleepy town of Höfn (pop. 1000). Mathias disappeared mysteriously. Distraught, Jo, Andy and I went to the pool to soak in the hot tubs where we were treated to a view of an huge guy in a speedo swimsuit. It looked really grim weather wise this morning. So, Jo, Andy and I decided to try the bus and get a lift up to Egilsstaðir, where we hoped the weather would be better. Of course, as soon as we topped the first big hill, 10 km out of Höfn, the weather was perfect. I know the sad faces on Jo and Andy were mirror images of mine. I felt caged in the bus, but decided to sit out the 4 hour ride (3 days worth of cycling) and put time savings to good use later in the trip. Then this obnoxious-old-drunk ðisco king Icelandic guy got on the bus. There’s something you don’t see every day. The bus put us down in Egilsstaðir early in the afternoon. Egilsstaðir is a town of about 1500, I think. We stocked up at the big grocery store and ate lunch. 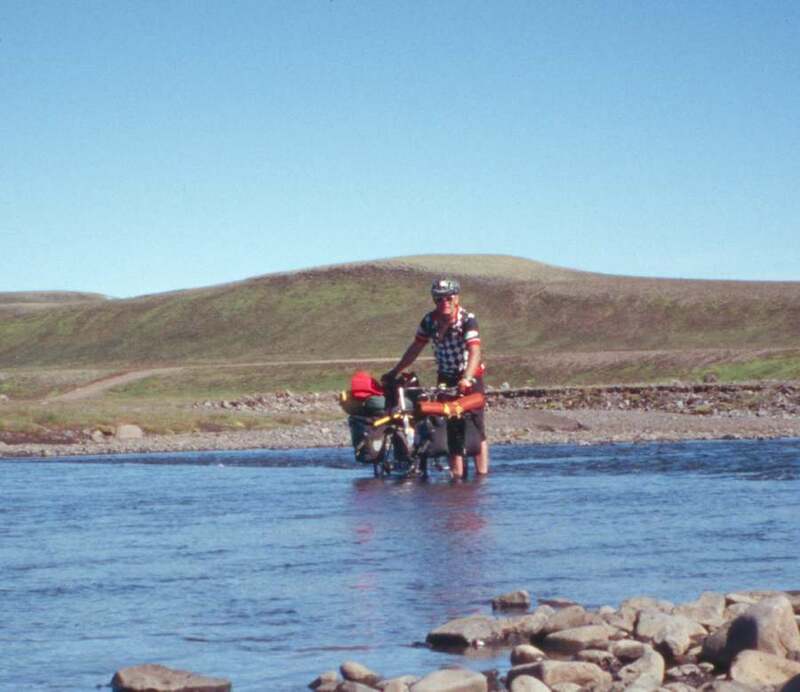 Then Jo and Andy rode north up Highway 1 and I turned to ride around Lagarfljót, a 20 km long lake west of town. 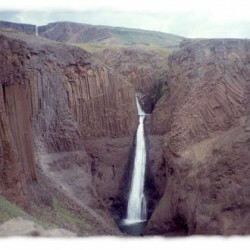 I wanted to see Hengifoss (below). Hengifoss is actually the upper falls (120 m), but Litlanesfoss, the lower falls is more spectacular. I continued on up the hilly road (note for readers of Lonely Planets guide to Iceland – really hilly) passing by Siðurklauster, the house of Gunnar Gunnerson, one of Iceland’s favorite authors (deceased). 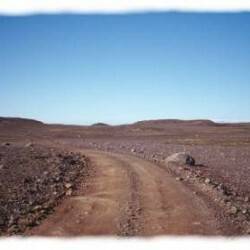 As I descended the next hill the road became large loose gravel. I made a couple of sphincter tightening corrections and saved it just inches from the ditch. Then I continued until I found a nice spot on the edge of a woods to camp for the night. Tortellini, coffee and tea for dinner. In the morning I broke camp and soon was in Hallormsstaðir, the largest forest in Iceland. I took a nice walk through the arboretum. Trees were labeled and it looked like they grew at 1/2 to 1/3 of the rate in the northern U.S. The big ones were about 12 meters high. Next stop, Egilsstaðir. I circled back through Egilsstaðir, stopping only to drop off some mail and to stuff my face with pastry. Then it started raining. Lovely. 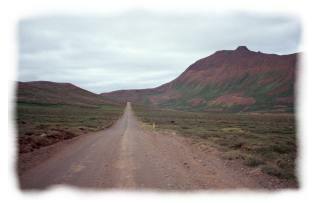 The road climbed gradually for the next 20 km before entering Jökuldalur, then the road followed the river. The road turned to dirt, but it was the good speedy stuff, smooth and packed and faster rolling than most asphalt. 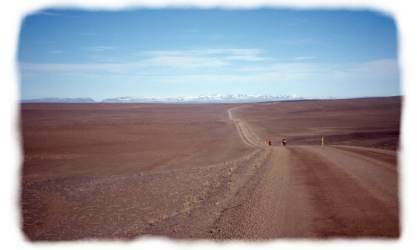 After 85 km the road climbed and climbed for many kilometers. The turf farm house at Sænautesel. Sænautesel, this was one of the favorite places of my trip. It was a fairly long ride, 103 km and much of it was climbing high onto the heath of Jökuldalsheiði. The road was mostly good dirt, but it had been misting all day. I was looking for a campsite, when I saw a sign for Sænautesel. The sign had the symbols for scenery and camping, but I knew nothing else. I turned onto the track and followed the rough road (the F907) for 5 km. Out of the mist this fantastic farm house appeared looking like little more than a haystack with windows. The farm of Sænautasel dates to 1843. 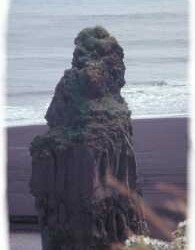 It was farmed until 1943 except for the period of 1875-1880 when the ash from the Askja eruption made the site unlivable. During that 100 years 9 different families lived there, the last for 36 years. The high heath is poor farming. The farming here consisted of trying to keep the sheep alive from year to year. Winters were hard, so as much grass as possible had to be cut and stored each summer to try and keep the sheep alive until spring. Sænautesel had up to 100 sheep, but the average was 66 per year. There were at one time 13 farms on the heath, the last was abandoned in 1946. 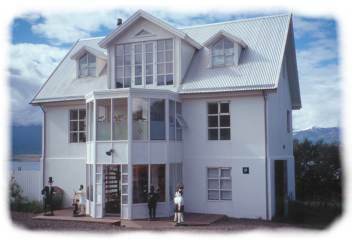 The farm house was rebuilt in 1992. There is a couple that stay there during the summer serving waffles and coffee to people passing by and maintaining the campground. Norwegian. She was visiting with her husband, who may have been about 70. She said her husband was born there. I repeated that to be sure I understood and she pointed to the upstairs loft and emphasized, “he was born there.” So cool. I rinsed the mud off in my legs in the lake and ate a dinner of freeze dried turkey stuff (not stuffing) and blåbær soup. Then into bed and read more of “Independent People” Sænautasel was making the book come alive. The three of us continued on towards Myvatn, via the main highway. The highway is good dirt, but very high and by the end of the day had climbed 4 high summits. 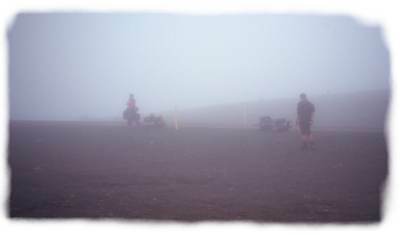 Uphills were long grinds, often into the clouds. The weather was reasonable enough for us, but this was not a stretch of road to be taken too lightly since it was so high and exposed. 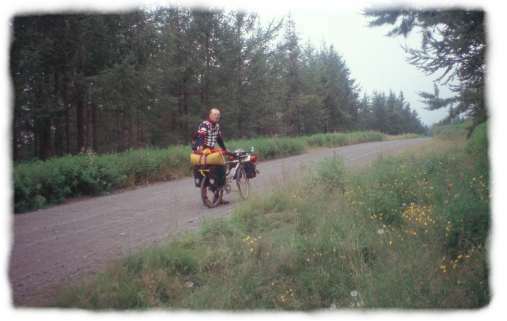 We met a german, no sleeping bag, no tent, shorts and short jersey (it was only 10 C) at the top of the last pass. He said, “Yes it’s cold, but at least I am at the top.” I chuckeled a bit and informed him that he only had 80 km and four more passes to ride over before he could find lodging. Stupid, really stupid. Want to read a great book? 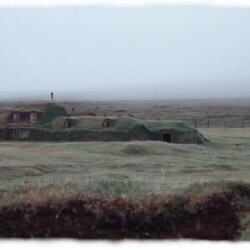 It’s about a poor farmer that lives on the heath in Iceland. After we rode down from the Jökuldalsheiði we stopped at Möðrudalur, which is a church, a farm and a snack bar. Andy treated us to coffee and a kleifur (Icelandic donut). Meanwhile, a horse tryed to eat Andy’s helmet, but some other tourists saved it, after videotaping the episode. We lunched at the single lane suspension bridge ofver the Jökulsá á fjöllum. 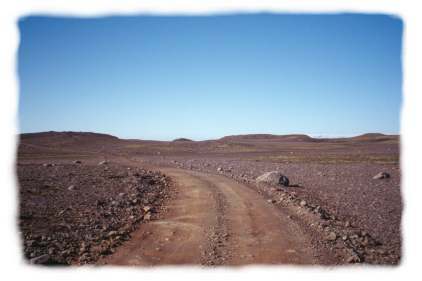 The road was still being repaired from the jokullaup that had happened a day or two before. It must have been an impressive flood as it had risen 4 meters to flow over the road. (At this time we still didn’t know the cause of the high water). 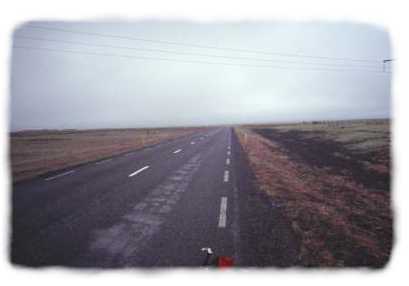 We opted for continuing on 40 km more to Reykalið, where I planned to take 2 full days off from riding. 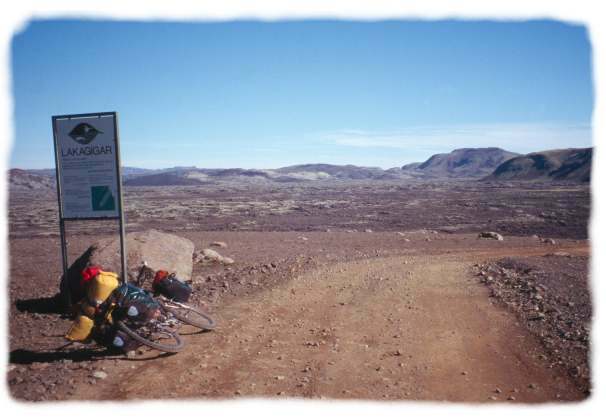 The rest of the ride was through a vast lava field. At Námafjell, a scenic and smelly (sulfur) thermal area the road climbed steeply on last time before diving down into Reykalið. There’s 3 campgrounds there, and we went for the one under the airport (just barely under) as it had fewer midges being a bit farther from the lake. 450 Ikr per night, with free showers. Hotdogs and tortellini for dinner. After musli and french toast Jo and Andy took the bus trip to Dettifoss. 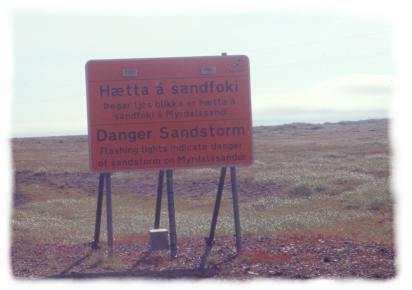 I hiked north along and across the Krafla lava fields to Krafla, itself. 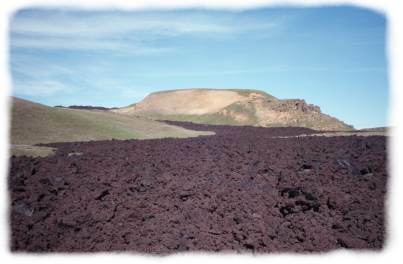 The old lava is 250 years old and now discolored with age and lichen. The new lava is jagged and dark and makes clinking noises when you walk on it. On the Leirhjutan ridge (right) there is a great view. Steam is still rising from the ground and there are some hot pools and mud pots. I saw 12 ptarmigan (rjupe) on the lava field while hiking. There is an electrical power station nearby that utilizes the thermal energy. On returning from my 25 km hike I met up with Bob, the Florida based artist again, and 2 more artist friends of his, George and Celeste. They had seen Mick Jagger earlier in the day. George got ol’ Mick to take her picture (no not Mick and her, just her) – left Mick a bit confused no doubt. I met this nice dutch couple also, but I din’t get their names. I tried to fix the dutch woman’s Gripshift, but I declared it dead. (Andy took a shot at it later and also declared it dead). Bob, George, Celeste and I went out for a beer (about $8-9 in Iceland) and then they had me over for dinner, lamb, stuffing, polenta and arctic char. Good, ‘nuf sed. Myvatn is supposed to be good bird watching. So today I went looking for birds. Maybe it’s timing, but the bird watching was not good. I talked later to some other birdwatchers and they thought that it was overrated also. 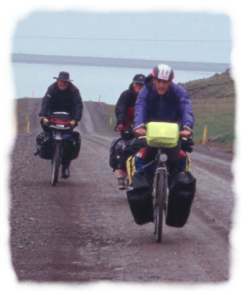 Me and the Kiwis packed up early for the ride to Husavik. They would go whale watching and I would continue on northwards. 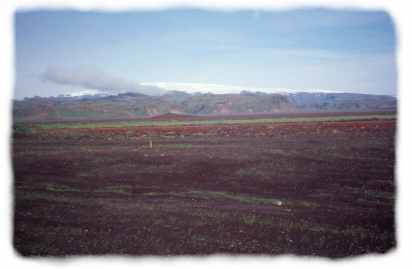 Myvatn, except for the lava, is a lush grassy area. So it was a surprise to get to the top of a hill and see nothing but sand (right). A sign beside the road told how this had been an area of birch and grass until poor land use practices turned it into the desert some 200 years ago. A few minutes later we dropped into the coldest fog I’ve ever been in. I had to stop to add all of my warm clothes. 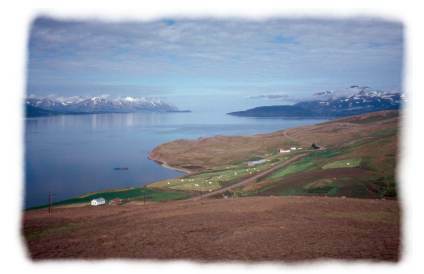 In Husavik (pop. 2500) the first stop was the bakery for coffee and pastries, what you might call lunch, I guess. Just as I was leaving we were leaving I ran into George and then lost Andy and Jo. So, I went back into the bakery with George and then the two of us went to Husavik’s excellent folk museum (Lonely Planets has this all wrong). Then finally I was off to points North. The Tjörnes penninsula is an uplift of the ocean floor. The color of the ocean is blue like I have never seen before. I misread my map yesterday. I was expecting about 100 km and the ride to Asbyrgi was a solid 125 km. 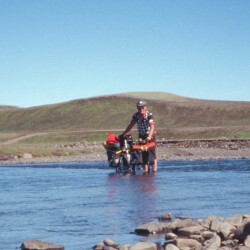 The last 20 km was across the Jökulsá á fjöllum river delta and into a bit of a headwind. Carbohydrate replacement was spaghetti, a whole package of chocolate covered oatmeal cookies, tea, cocoa and some hverabraud ( a really heavy rye bread that is cooked in hot soil near Reykalið with jam. 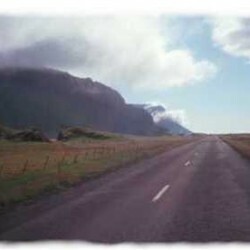 I followed the road north for about 10km before turning east to cross the Hólaheiði. 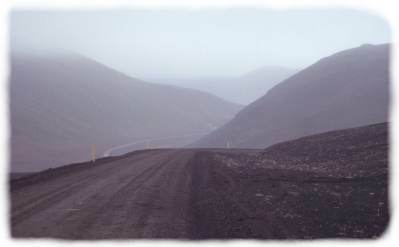 The Hóheiði road was a bit tough. It was loose and rough, although ridable, except for a few steep uphills. The most difficult climbs were, of course, near the end. In the middle of the ride it blew and rained some. It was a 6 hour ride for 80 km. But, I probably saw less than 15 cars all day. 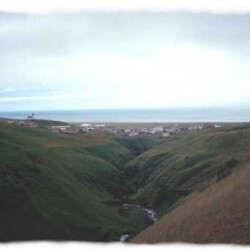 Raufarhöfn, pop. 400 It was windy and cold. There was only one other person in the towns campground, a circular wind bunker near the harbor. 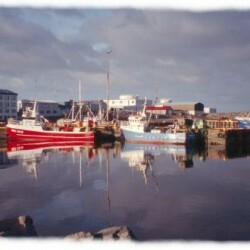 The town has been a port since viking times. This turned out to be a pretty good bird watching area. and some ptarmigan near here. There are some old turf ruins near the lighthouse and hundreds of fishing floats, big steel ones, plastic ones, yellow ones, cork ones, you name it. I was passed by 6 cars in 5 hours. It was calm and peaceful. I loved every minute of this day. After turning south I rode past several farms and then turned inland and climbed up and around the back of a high headland. Then down and into the small town of Kopasker, pop 150, maybe. 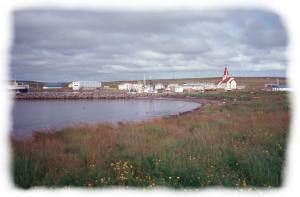 Kopasker was badly damaged by a magnitude 7 earthquake in the 1970’s, so most of the town is fairly new. The church and museum/library sit a short distance from town. Entering the museum I was met by the days attendant. As often happens, I was the only visitor and so I got a guided tour of the museum and was invited to sit and have coffee and cookies afterwards. Here, I found out about the jokullaup of a few days earlier. 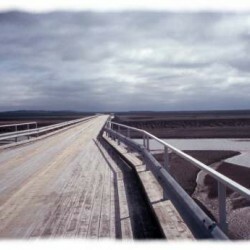 It had washed the bridge over the river Sandur out to sea (floated past town, yesterday). 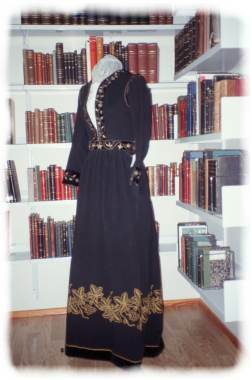 Among the usual tools and household items the museum had a nice collection of locally made textiles, 3 excellent Bunader, hundreds of leather bound books that a local farmer hand bound by himself and a horse drawn hand pump fire engine (with optional ski attachments) purchased by the town in 1943. The warden at Asbyrgi recommended that I take the bus into Dettifoss. I wasn’t looking forward to another bus trip, but he said that the road was exceptionally bad and that there was no scenery from the road. He was correct on both counts. I was charged 2100 kr for the ride up to Dettifoss and back as far as Vestardalur, from where I would hike the remaining 13 km. The road was bad, it was washboard almost the whole distance and you could see none of the river canyon without taking the 3-4 km dead end turnoffs. I only saw two cyclists, and they did not look the least bit happy. Dettifoss turned out to be a lot of water falling into a canyon, and as often happens, impossible to photograph in a single shot. the spray was incredible, giving the effect of a full rain for a 1/2 km downstream. 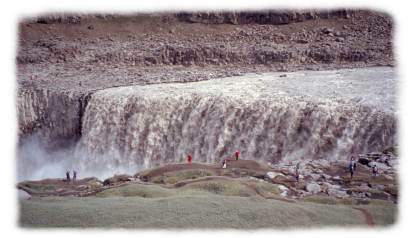 Dettifoss is the largest volume waterfall in Europe. From Dettifoss the bus rattled back towards Asbyrgi, stopping twice for scenery before finally dropping me at Vestardalur. God, it was nice to be out of that damned bus. Vestardalur was very cool. 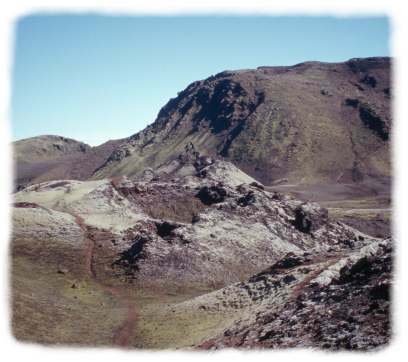 It was dozens of basalt plugs that had been the cores of volcanic cones. The hike followed the top of the canyon and was nice and quiet. I saw no one else the whole distance. I scared up several ptarmigan and snipe (including a young one that couldn’t yet fly, but ran off down the trail). The park warden had been correct that the best way to see the canyon is on foot. 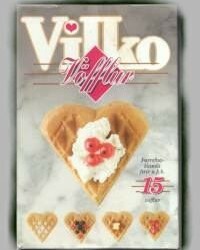 Waffles for breakfast. 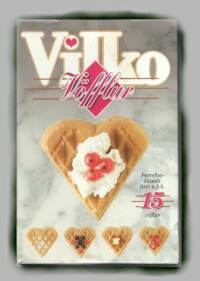 Iceland has the best instant waffle mix. It’s in the dessert section for you Americans that eat them for breakfast. Rained much of last night, cleared briefly while I was making breakfast, rained more, stopped while I packed my gear, then a driving mist for the last half of the sands. It stopped as I started the 3 km steep climb. Near the top some guy came out and took my photo. When I stopped to check out the fulmars soaring along the cliff tops he came up and asked if I’d like a copy of the photo. Turned out that we live about 8 km apart in Seattle. The weather improved and stayed fine for the rest of the day. In Husavik I stopped for stove fuel, food, and my usual viking raid on the bakery. I thought about staying there, but then I thought about a short ride into Akuyeri tommorrow, and that idea won. Rest of the ride was pleasant and mostly flat. Camped at Fossholl, a tourist hut 1 km away from Goðafoss. Met 3 Italian cyclists and later had my first encounter with the German “family o’ five” cycling team. As evening came on I found that I had Goðafoss all to myself. The falls is just short of a half circle in shape, with water pouring from four places at two different levels. 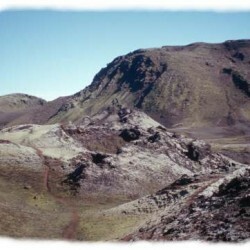 þorgeir, the lawspeaker to the AlÞing from this area was tasked with deciding whether Iceland would be pagan or christian. He spoke that Iceland could not be both or it would be a country divided and so declared that Iceland would be chrisitian. 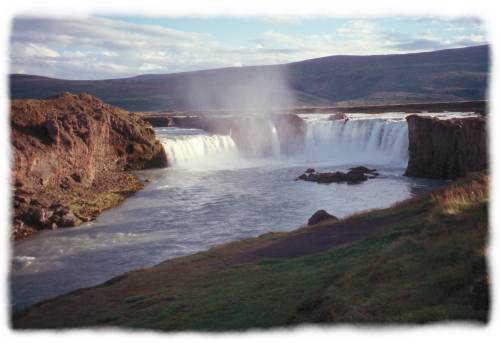 He the gathered all of his pagan idols and threw them into the falls, hence the name Goðafoss, which translates to God Falls. 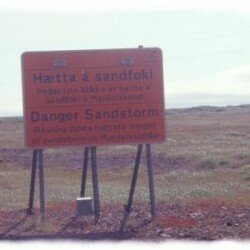 I followed Highway 1 from Goðafoss towards Akuyeri. It was uneventful and pleasant, but not to scenic, at first. There was one very long climb, which put me at the top of the ridge looking down into Eyafjorður, the fjord that Akuyeri is on. It was a good fast downhill to the fjord and then rumble on to the big city. 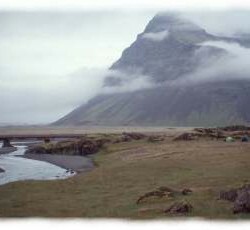 The first european born in North America (the son of Guðriður þorbjarnardottir) settled on this fjord after returning to Iceland. That was about a thousand years ago, of course. The fjord is very nice, anyways. It is framed by snow capped mountains on bothe sides. 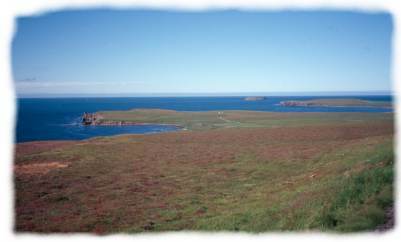 The penninsula on the eastern side has very few inhabitants, particularly in the north. I rode north along the fjord from Akuyeri. I stopped at Dalvik, to raid, yet, another unfortunate bakery, and so I did, even though they did not have any coffee. The road climbed high onto the cliffs over the fjord and yielded a great view. Then I came to the Mulagönger. I dredged some viking speak out of my so-so norsk ability and finally figured out that it meant Mula “tunnel”. 3.4 km of single lane, downhill tunnel with turnouts every 200 m. Fortunately it is dimmly lit. There wasn’t much traffic, but there also wasn’t much extra space. See the headlights, quick decide, can I make it to the next turnout or not? The day was positively tropical after I got out of that dank hole. The exit was just outside of Olafsfjorður, a town of 1000 and one ski jump. I stopped at the gas station for a couple cups of coffee. Then it was up into the mountains. The climb from Olafsfjorður was enjoyable in a tough sort of way. 4 black sheep threatened to charge along the way. I had to defend myself, so I barked. Sure, it was cruel, but they left me no choice. The emergency hut signaled that I was near the top and then there was a long descent to Miklavatn, an inlet from the ocean. I decided to push on towards Hofsós. The decision to push on made for a long day, but it turned out to be most fortunate for me. There isn’t too much up in this area of Iceland. So, the farm of Lónkot came as a great surprise. 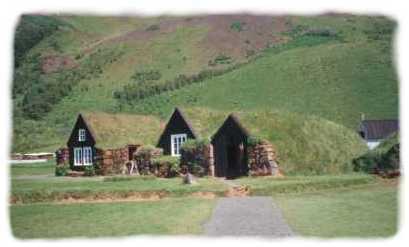 Lónkot is a farm, with a golf course, a bar/restaraunt and guesthouse, a campground, a special events tent (at least 15 meters in diameter) and boat tour guide service. I was the ony visitor until about 10:00 pm when 4 guys showed up to play golf. The owner, an interesting guy himself, is an art enthusiast and has commissioned some great pieces for the property. Shown here is Olöf the Sorceress. 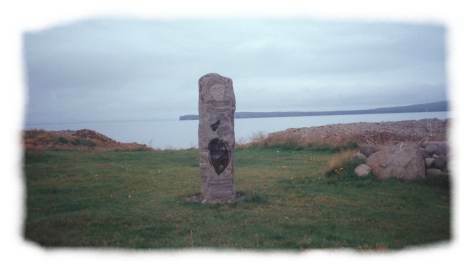 The column is a 2+ meter long basalt column from the riverbed in Hofsós. 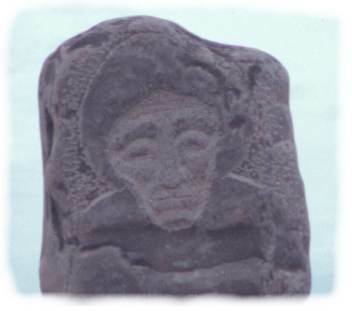 The figures on the column are pecked in, modern petroglyphs. 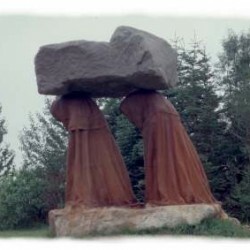 It is a very powerful piece combined with the natural setting. I spent quite some time discussing art and other stuff and listening to jazz with the owner (for those of you that think Icelanders don’t talk). He was also fond of the work of Sölvi Helgasson (1820-1895), an artist that came from this district and he had another sculpture commemorating him, as well as many prints that decorated the interior of the pub. In fact, the bar is named after Sölvi. Halfdan and Olöf of Lónkot are in many legends. The men, of course, thought and said that this was impossible, but of course they did not say no. Halfdan dropped his hook into the water and soon brought up a piping hot blood sausage, which the men all ate and enjoyed very much. Then one of the men noticed that the halibut was gone, “What has happened to the halibut that we caught?” Halfdan explained that while he had conjured the sausage away from Olöf, the sorceress had claimed the halibut in exchange. 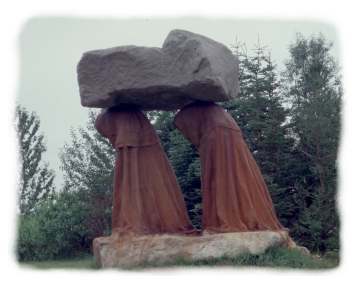 On the sculpture, you can see Olöf of Lónkot holding the halibut by the tail. Behind the statue is the islands of Drangey and Malmsey. 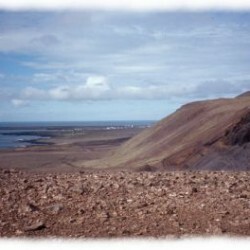 Drangey is where the outlaw, Grettir, was hunted down and killed in 1050. It is in the sagas. Light drizzle in the morning. Stopped in Hofsós to see the old danish warehouse, built in th 18th century and tarred within an inch of it’s life. Notice the lapstrake roof (not shingles). Also stopped at Graflakirkja, a rebuilt 18th century church with a circular graveyard (a very old design). Stopped for buger and fries at Varmalið, a poplular stop on Rt. 1. 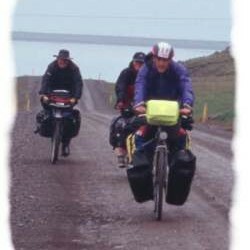 There was a BIG climb out of Varmalið, where I passed the german “family o’ five” cycling team again, one of them sporting a 4 wheel drive mudflap. Then I rumbled into the giant Blondous campground, went to the pool and grocery. Time is getting short on the trip now, so I spent some time figuring out how to optimize the rest of my the rest of my trip. Then I read a bunch more of Independent People. Misty low clouds were the weather for the day. I headed south on Rt. 1 with a light tailwind and rain. There were a few scenic spots that I was planning to ride to, but with the low clouds it didn’t seem worthwhile. So, I just rode and rode and rode. I stopped at Staðir, for coffee and pastries and had a talk with the cook and cashier who liked the beadwork on my hydration pack. Passed through Bru and climbed high onto the heiði, along with the obligatory heiði rain. Stopped at Grabrokarhraun, a volcanic fissure/crater. Finally after 181 km I rode into Bogarness. I ran into the dutch “gripshift” couple again. They were having a fine trip too and were about to head out around the Snæfellsness penninsula, a route that I really enjoyed in 1996. I am camped at a farm (right) north of Mt. 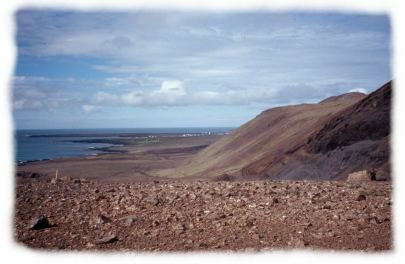 Esja and near Hvalfjorður. This morning I had waffles and then headed the long way around to Reykjavik. 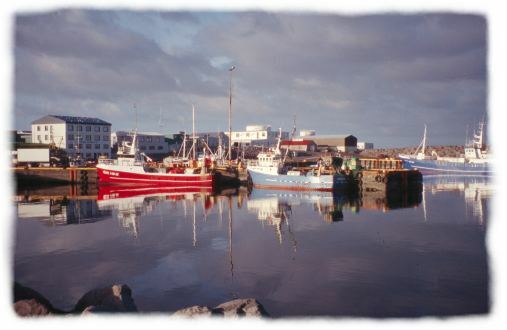 I had been to Akranes in 1996 (very nice) but I wanted to see something else. 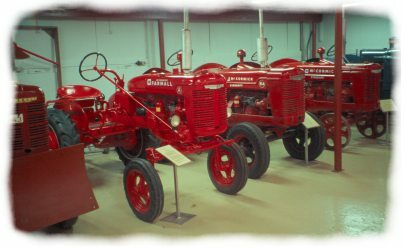 I saw some signs along the road and translated them to say “farm equipment museum”. I like tractors and machines so it sounded like a plan. Hvanneyri turned out to be an agricultural college. Very nice campus for 50 students per year. The museum was excellent, everything inside was in great condition. There was a handcraft shop also, where I got a wool shawl, some reindeer buttons and a reindeer horn needle case. 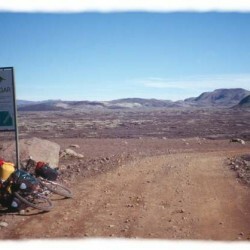 Then I rode back and over the mountains to Hvalfjorður. With the new Akranes/Reykjavik tunnel, the road around Hvalfjorður is fairly quiet. It is also very scenic. 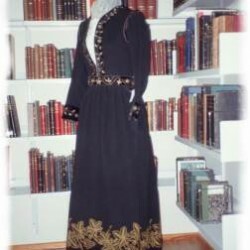 Hafnafjorður. Waffles and blueberry preserves for breakfast, again. How much more can I take? I started riding about 9:30 and traffic was light until I reached Mossfellbaer. 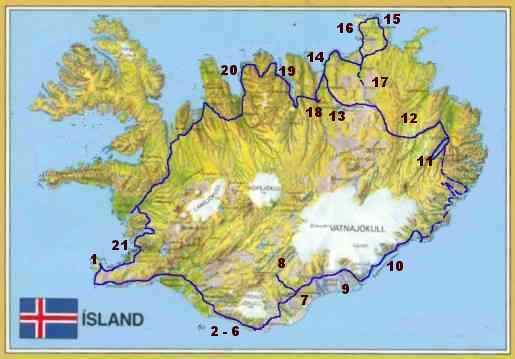 I navigated by feel and dim memory to Halfnafjorður. I didn’t like the super-big campground in Reykjavik last time I was here. 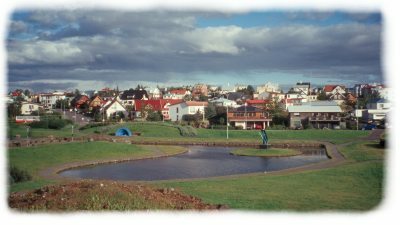 The campground in Halfnafjorður is quiet and the town is much more relaxed. Took a shower, ate lunch and toured Halfnafjorudur. The Halfnafjorður Cultural Center had some nice art, especially the woodcuts of a longtime local. I also visited the Bjarni Sivertssen house, built in 1803-1805. Then the city museum, nice local history displays. During dinner a mini-van drove into the camp and disgorged NINE germans and a lot of camping equipment. They looked like circus midgets piling out of that little vehicle. August 17, Day 26 One more day to go. Bus to Reykjavik. It’s only 10km, but the traffic in the city is not fun for cycling. Went down to look at Iceland’s whaling fleet, 4 old ships that haven’t seen action in several years. Then over to Tjarn, the lake that the city hall sits on. I went to the National Gallery where my favorites were Asgrimmur Jonsson and þorarinn þorlaksson. Both post-impressionist landscape artists from the late 19th and first half of the 20th century. Then I went to Jonnson’s studio/house, about 1 km away. There were several excellent large scale watercolors. The upstairs studio is still heavily spattered with paint. I also wnet ot the Arna Magnussonar Institute, which is dedicated to preserving the ancient manuscripts of Iceland. It was small, but absolutely fantastic. The works about St.þorlakson were on display (6-700 year old vellums). One more trip to Reykjavik. I wanted to see Kjarvalstaðir, the city art museum. This was mostly modern art, my favorite piece, by Magnus Pallson, “In Memory of the Burning of Njal”. It was a large painted canvas, 5 m x 8 m that ran up the wall of the gallery. There were typewriters on pedestals, one for each of the victims of the burning. Then some gift shopping and back to Halfnafjorður. Packed up and rode out Keflavik, stopping at Stekkurkot, a rebuilt fishermans house just east of Keflavik that is run as a small museum trip.